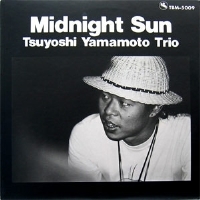 Midnight Sun is the ninth album by pianist Tsuyoshi Yamamoto released by the Three Blind Mice label. Virtually unknown when he made his first recording in 1974, he had become one of the most popular jazz pianists by the time of this recording in 1978. This album was recorded shortly after Yamamoto returned from his 7-month musical trip to the United States which included his guest appearances at the Monterrey Jazz Festival, playing with Dizzy Gillespie in a local jazz festival in San Francisco, and a long stay in New York where he met with Barry Harris and studied with bassist Sam Jones. Along with his maturity as a musician, an original compositoin "Blue Manhattan" was a musical souvenir he brought home from New York. This is another great, swinging piano trio album and a must-have item for fans of Tsuyoshi Yamamoto! Recorded live at Onkio Haus, Tokyo on June 3 and 4, 1978. Blu-spec CD is compatible with all regular CD players. Paper sleeve special limited edition.